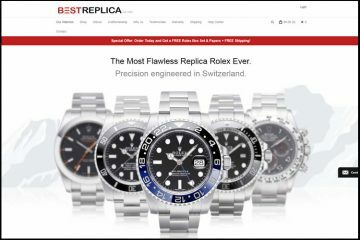 Are you looking for a Swiss made replica watch? 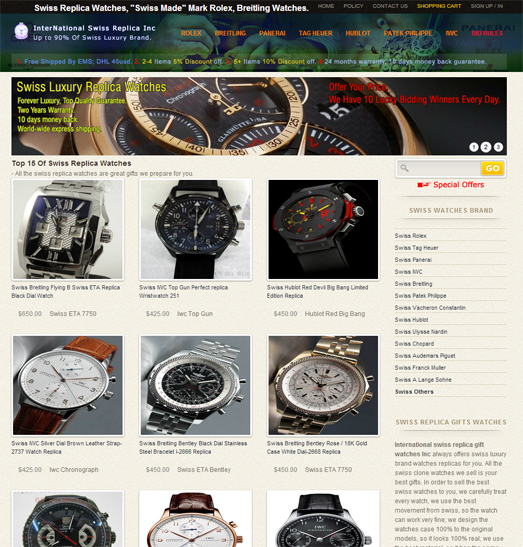 Eswissreplica.com has up to 3000 designs from the most famous watch brands around the world. Plus, the delivery is free. It sounds really tempting, isn’t it? But before you lose your cool and start spending all your savings, let’s review this store and see if it is a trusted seller or not. The company provides two shipping choices: EMS or DHL. The first options is free of charge and all packages shipped this way take about 7-15 business days to arrive to the customer. The second option costs a lot more, about $45, and it takes about 7 business days for the order to be delivered at its destination. Of course, a tracking number is supplied for each package. 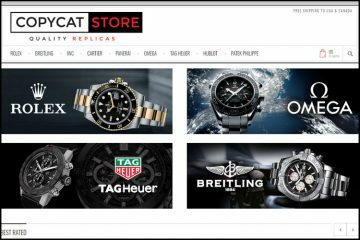 The watches come with a two years warranty which covers any manufacturing defects. Furthermore, if you receive the wrong item or an already broken one then you can ask for a replacement as long as you contact customer service right away. Also, within the first 15 days you can ship the watch back and request a full refund if you are not happy with the item. The returned watch must be unworn. Eswissreplica.com is such an incredibly distorted stuffy website. The whole store is just a big mess: ugly banners, colorful text, bulky menus and disproportioned photos. I don’t want to sound harsh, but just because you have merged some text, pictures and links do not mean you have constructed a website. Sometimes it is a whole lot better to make it simple and use the plainest design possible than to compile a bunch of unrelated elements hoping to impress your potential customers. 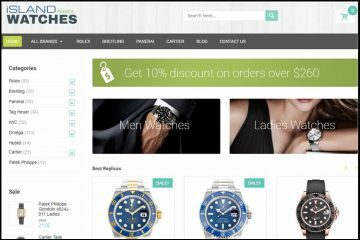 An online store needs to be elegant, classy, clear and clean, and most important: easy to use. Sadly, this is not the case with Eswissreplica.com. The top side product menu is actually an orange text over a green and blue photo. This complex color scheme looks absolutely grotesque. Here we find only six watch brands, probably the most popular ones. The company sells over a dozen of the best luxury watch names and each collection surprises us with the most iconic models ever made. The problem is that there are too many products and we might give up and simply leave the website before getting the chance to order something. Why is that? Because there is no way to filter our search or to find just the type of designs that interest us. The watches are divided only by brands. When a company provides an exaggerated number of products such a primitive classification is pointless without the correct implementation of an advanced search option. Apparently, the company sells only Swiss made watches, but strangely enough the prices start at $150 which is very low for an actual ETA Swiss made mechanism. The average starting price for these types of replicas is about $300. The fact that here we find Swiss watches at half of the price makes us wonder if these are indeed equipped with a Swiss movement. 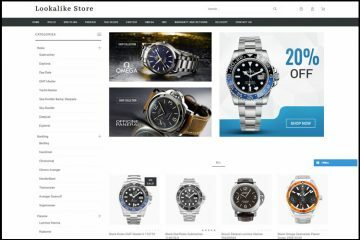 As expected, the prices for the so called Swiss watches sold by Eswissreplica.com continue to go up and reach a maximum price of $600. Surprise, surprise! It is only after we click on an item when we finally find out that there are two pricing options available for each replica: the regular price for Swiss quality and half a price for AAA quality (probably Asian movement). Besides this very important detail, the description is quite short and in four or five brief lines it lists a few basic details for each watch. Eswissreplica.com is able to process only Visa card payments. No other form of payment is available. I absolutely do not approve with websites that are not able to provide alternatives to card payments, moreover, the ones that take only one type of Card Company. To show that you are a reputable merchant you must be able to process at least two different types of cards, not just one. Not to mention, people who do not own a card and want to shop online need an alternative payment method such as Western Union, Bank Wire or Paypal. Pictures: The pictures of these replicas raise a serious question mark regarding the company’s legitimacy. The number, quality, style and watermarks on the photos vary from product to product. Some watches have only one photo while some have two or three. Some images say “ebestreplicas.com” while others say “eswissreplica.com” or do not have any watermark. Some pictures are very clear and you can see every marking and detail while others are terribly unclear. And finally, some have black background while others have a grayish or white one. All these show that the pictures may very well not be of the merchandise sold by Eswissreplica.com or better yet the company may not have any products to take pictures of because it could actually be a scam. Customer service: One of the biggest disadvantages of a Chinese replica website such as Eswissreplica.com is that it is unable to provide real customer care. It either doesn’t see its importance or it does not have the necessary resources or personnel to offer such services. The only option for a customer to contact this company is by Contact Form and as you could imagine the reply won’t come too soon. By the time your inquiry is answered you could very well find another dozen websites capable of providing more efficient services. Summary: Eswissreplica.com is definitely the replica website with the most Cons I have gathered so far: highly unprofessional design, low website usability, unclear product specifications, questionable product quality, leery price-quality correlation, copied product pictures, dubious payment policy and the lack of customer service. I honestly wouldn’t recommend this website to anyone.